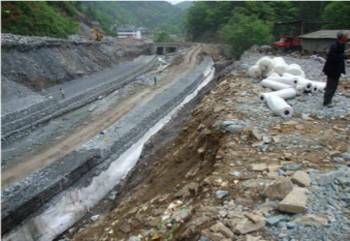 Solutions were needed to mitigate the natural hazards present on this mine site in Hubei Province, China. Rockfalls from the steep mountainous landscape, risk of landslides from accumulated mine residue and increasing run-off from heavy rains in the area were risks that had to be addressed. The Green Terramesh and MacMat R solutions also provide an ideal environment for the re-establishment of vegetation within the mine. This is an increasingly important consideration for mine operators in China as they embrace ‘green mining’. A great advantage of using gabions and Reno mattresses on this project was the availability of suitable durable rock fill actually on the project site. Grading and re-using this rock material removed the need to import suitable fill from rock quarries, reducing the carbon footprint of the solutions.